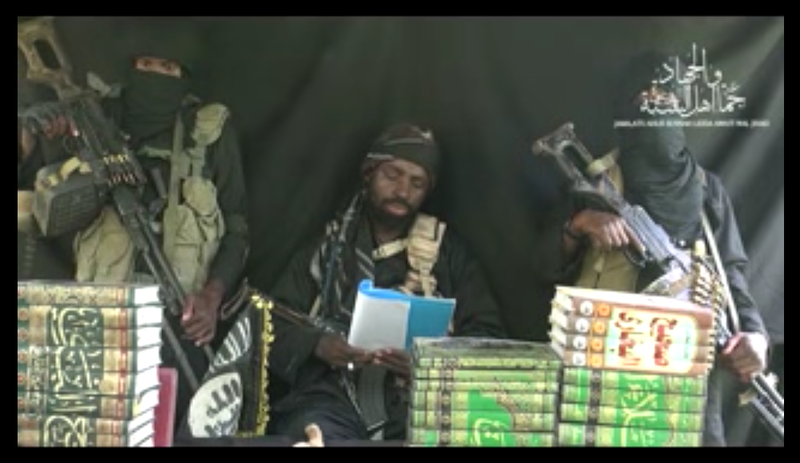 Christian Media in Nigeria : Is Boko Haram's leader Abubakar Shekau dead or alive? Video claims he is not wounded. Is Boko Haram's leader Abubakar Shekau dead or alive? Video claims he is not wounded. A video has surfaced online purportedly claiming the Boko Haram's leader Abubakar Shekau was not injured as stated by the Nigerian Military. According to the man in the video addressed to "tyrants of Nigeria in particular and the west of Africa in general"; "You broadcast the news and published it in your media outlets that you injured me and killed me and here I am,"
"I will not get killed until my time comes," he added in the 40-minute video posted on YouTube and delivered in Arabic and Hausa. Meanwhile the Military has reacted to the video by issuing the following statement signed by Acting Director Army Public Relations, Col. S.K Usman. The attention of the Nigerian Army has been drawn to a video clip released by the so-called Abubakar Shekau faction of the remnants of the Boko Haram terrorists group this morning. In it, the purported leader of the group in his usual insane manner made all sorts of assertions to the point of threatening various towns, groups and individuals. He also tried albeit failingly to deny the air raid by the Nigerian Air Force in which he was wounded. The video has shown beyond all reasonable doubt the earlier suspicion that the purported factional terrorists group leader is mentally sick and unstable. The ranting is also another sign that the end is near for him which is part of the signs of all wicked people. The Nigerian Army wishes to assure the public that they should not be bothered by the contents of the video clip. This is because the facts on the ground speak for themselves. It is public knowledge that the military has been making concerted efforts to clear the remnants of the terrorists and rescue all persons held hostage by them especially the abducted Chibok Secondary School girls. This is a task that will be accomplished, no matter how long it takes. We are determined in this regards. Already thousands of persons have been rescued by troops from the terrorists. The video has further shown that he has derailed and no longer believes and practices the Islam he professes to follow; as he was absent at the last Eid prayers video. It is equally reported that he could not even lead prayers. The public should not be fooled by this individual. No nation or society would believe him or any Boko Haram terrorist based on antecedent and as he has shown over times to be irrational and therefore unreliable especially when it comes to negotiations on the release of the abducted girls. Therefore he must release them unconditionally. We want to assure Nigerians especially the residents of Maiduguri, Kano, Kaduna and Zaria not to panic as we have more than what it takes to defend them and deal decisively with the remnants of the terrorists group. We would like to reiterate that Boko Haram terrorism as it was known, is gone for good. We are just counting down to the day when all the few remnants will be totally wiped out or brought to justice.